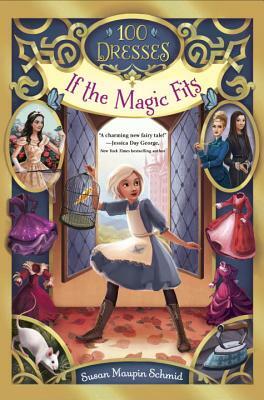 Try on a little magic with this lighthearted fantasy adventure! For fans of the Land of Stories and Descendants series. Inside an enchanted castle, there’s a closet—a closet with one hundred dresses that nobody ever wears. Dresses like those need a good trying-on, and Darling Dimple is just the girl to do it. When she tries on Dress Number Eleven, something unbelievable happens. She transforms into the castle’s Head Scrubber! It turns out that each dress can disguise her as someone else. And Darling is about to have an adventure that calls for a disguise or two . . . or a hundred. Susan Maupin Schmid writes in a little blue office in Iowa. She has a particular weakness for good coffee, good books, and beautiful dresses. Her closet doesn’t contain a hundred dresses—yet—but someday it will. Susan is also the author of Ghost of a Chance, the second book in the 100 Dresses series, and Lost Time, a middle-grade science-fiction adventure. To find out more, visit SusanMaupinSchmid.com and follow her on Twitter at @maupinschmid.